THOUSAND OAKS, Calif. (AP) — Gerald Everett isn’t the first name mentioned when fans discuss the Los Angeles Rams‘ offensive skill players. The backup tight end probably wasn’t the eighth or ninth name mentioned, either — at least not before last week. Everett realizes plenty of people will know his name going forward after the second-year pro with the unique collegiate past emerged as the unlikely hero of the NFL’s most eye-catching game of the year. 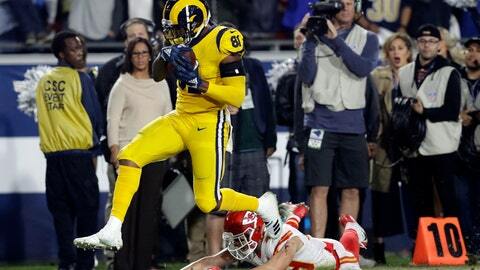 Everett caught two touchdown passes during the Rams’ epic 54-51 victory over the Kansas City Chiefs last week, including an athletic grab on a 40-yard throw from Jared Goff for the game’s final points with 1:49 to play. Although he had just 31 career catches entering that showcase victory, Everett appears to be surging into a significant role as the Rams (10-1) ramp up for the playoff push. While he doesn’t yet have the bulk and blocking power of a classic tight end, his speed and hands are already being exploited with increasing frequency by coach Sean McVay. Everett isn’t getting a tremendous amount of opportunities to make plays in the Rams’ fluent, talent-packed offense. He has been on the field for only about 25 percent of their offensive snaps, and he has been targeted only 27 times by Goff. Everett has turned it into 18 catches for 210 yards and three touchdowns. Everett and fellow tight end Tyler Higbee aren’t often primary targets for the Rams’ sophisticated offense, but Everett’s ability to beat defensive backs from a standup position makes him useful in mismatches — such as the one he exploited to score his big TD. With Everett lined up outside as a receiver, Goff looked at the Chiefs’ defensive scheme and figured Everett probably would be open. Everett did his part by getting loose from safety Daniel Sorensen at the line of scrimmage, and after Goff delivered the exceptional throw down the sideline, Everett caught it and somehow stayed inbounds, tiptoeing his way to a score. Everett’s entire career has been fairly unlikely. He was a second-round pick by the Rams in 2017 out of South Alabama, which had never before produced a drafted NFL player. He only ended up with the Jaguars after starting his career at two junior colleges and then going to UAB, which subsequently dropped football. Everett’s friends on other teams tell him they know the Rams have called a passing play when he’s on the field, so he realizes he needs to work on his blocking. Until then, he hopes to continue to grow as a target for Goff and McVay. NOTES: CB Aqib Talib participated in practice Wednesday in the next step of his comeback from ankle surgery. Talib has missed the Rams’ past eight games, but he returned to the active roster from injured reserve Monday. … DT Ethan Westbrooks didn’t participate in practice due to an illness. The Rams are otherwise largely healthy.